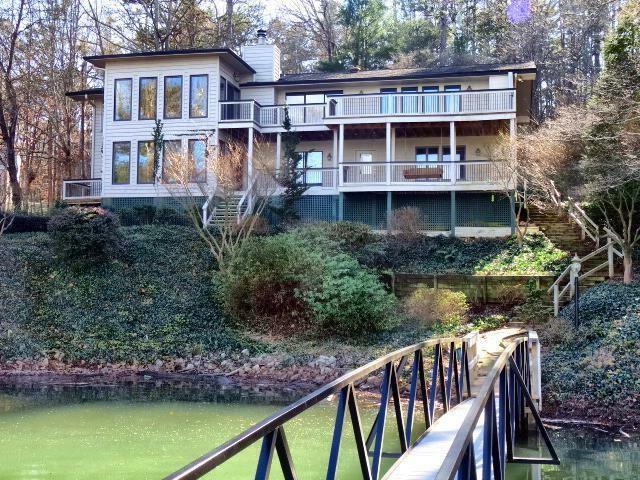 Attractively priced waterfront home with lake views from most rooms in amenity rich Keowee Key Subdivision. Quality construction and rich material choices are evident in every room in this two level traditional designed home. Features include upgraded hardwood floors, granite counters, travertine flooring in kitchen with upgraded designer Cherry cabinets including center island. The Master Bath is spacious marble tile floors, walk in shower, skylights and built in storage cabinets. Lower level living includes 3 bedrooms, spacious den, and workshop along with two car garage. Outside you will find a beautifully landscaped yard with walkways leading to the lake and a floating boat dock. Here you will be able to bask in the sun of the summer and play in the crystal green waters of Lake Keowee with friends and family. Make this home a must see when looking for that perfect lifestyle offered by Keowee Key. Renovations totaling more that $14 Million in Keowee Key can be seen throughout in the Clubhouse, Golf course, Fitness Center, Tennis/Pickleball courts and community pools as well as walking trail additions.